For those of you using 3D Printers, what is the least expensive range of equipment (printers) that you would recommend for KAP? I am aware of these machines, but I do not own one, nor have I ever used one personally. Hi CG - as you may have noticed, I just bought a Creality Ender 3. They cost less than $200 and there are lots of very positive reviews on the web. So far my experience has been almost totally very positive. It comes as a kit (partly assembled) but there are several YouTube videos showing how to assemble it - no more difficult than putting an IKEA chest of drawers together! I enjoy that sort of thing anyway. Printing an existing design (e.g. an STL file downloaded from Thingiverse) is similarly quite easy - you'll need a piece of software called a splicer to turn the 3d design into a set of instructions (gcode) to print the various layers. I use Ultimaker Cura but Slic3r works as well I think (both are freeware). Making your own 3D designs requires another piece of software - I use 123D Design (by Autodesk) - also freeware. How easy you find it depends on how good you are at technical drawing I guess. I had used Adobe Illustrator quite a bit to produce 2D drawings to be cut with a laser cutter, which maybe helped. Back at the beginning I said 'almost totally positive' - I have had some problems - one build went wrong because my computer (which was driving the printer) went to sleep while I was out of the room - when I came back and woke it up it went on printing but the extruder hot end was in the wrong position so the top was out of whack. I had another problem when I forgot to ask it to add support for an overhanging part of the design which collapsed during building as a result. Adding support is just a question of clicking a tick box - the slicer builds easily detachable 'rafts' under the overhanging parts - I just forgot. As well as the printer (which comes with all the tools you need to put it together and use it), you'll need to buy filament of course. Like most, I use PLA filament - a 1kg (2lb) reel (about 300 metres/yards long) costs me around £15 (say $22). So far I've built at least 15 things (8 or 9 were add-ons to the printer - fan covers etc) and have probably used much less than 50 metres. I know Cris bought a Tevo Tarantula some time back (I talked to him about it at KAPiCa 2016) he may have some words of advice. I have been playing around with 3D printers for a couple of years. I started with a Tevo Tarantula (righthand side of the photograph below), which comes as a kit of parts directly from China for around $250. The kit has a very helpful community of folks on Facebook and is fun to build. I have made quite a few modifications to the kit (lighting, BLTouch for bed leveling, new extruder and hot end). Having run 20+ kilograms of PLA filament through the printer I can report it does a fine job. 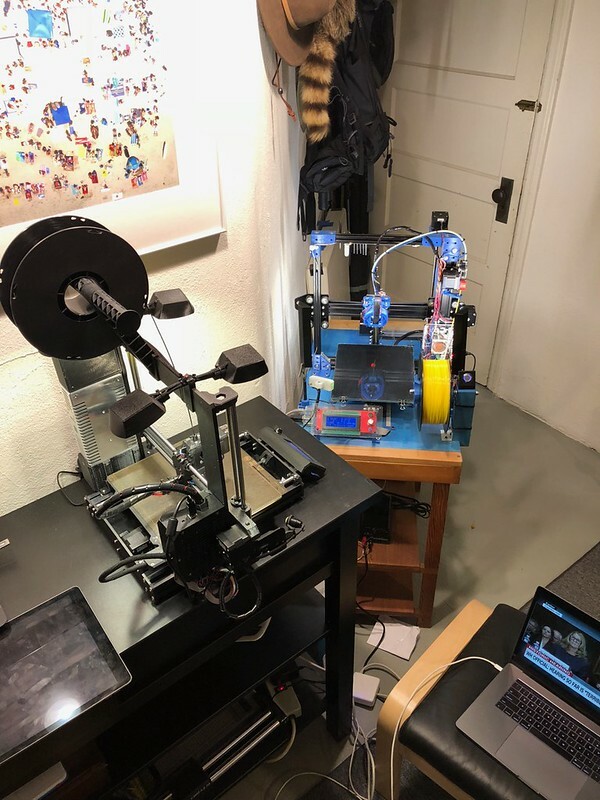 The printer on the lefthand side of the photograph is a newly-acquired Prusa i3 Mk3. This printer also came as a kit of parts (Czechoslovakia, $800). This is a higher quality printer that is a bit more sorted out. Either printer will do a fine job making KAP-related components. On the software side, I use Autodesk's Fusion 360 for 3D design, the somewhat expensive Simplify3D for slicing, and OctoPrint to manage to transmit Gcode to the printers and monitoring their progress. Eack of these has a learning curve and each has worked well for me. I used 3d printing several times in the last few years but I don't have a printer. I know someone who has one and printed my parts. Eventually I'd like to buy one. For designing my parts I use FreeCAD. 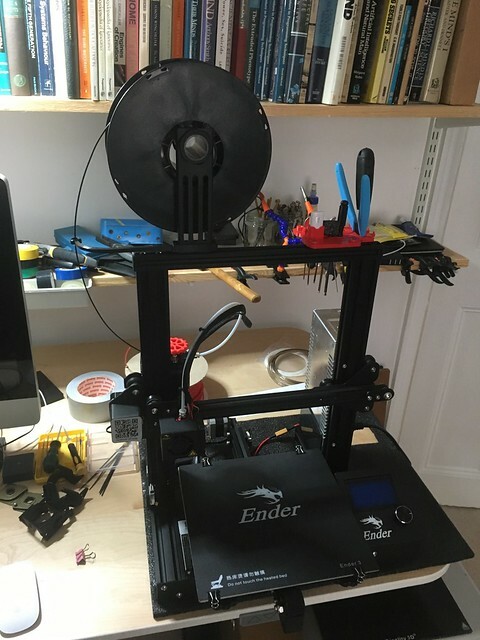 Here's a picture of my Creality Ender 3. The red tool holder at the top, the red extruder knob and the filament guide are some of the parts I printed, others include a fan shroud and electronics cover for the electronics and one or two others no visible in this picture. @Dave, @admin, and @YvonH - Thanks for the info!! !